WarriorRx Muscle and Joint Pain Rub instantly penetrates the skin and begins reducing inflammation by eliminating toxins and impurities that have formed and gathered there. This product also contains several natural anti-inflammatory ingredients that flood the area and immediately and dramatically reduce burning pain, soreness and discomfort. It increases circulation and promotes faster healing in the affected area. Arnica Oil This herb is quite simply amazing when it comes to speeding up the healing of joint sprains and muscle strains. Research also shows that it helps bruises heal faster. Cayenne Pepper Used by Native Americans for over 9,000 years, cayenne acts to eliminate, or “burn up,” substance P – a compound that carries pain messages to your brain. Your skin will tingle a bit when applied but then that sensation will vanish along with your pain. DMSO Is a near-perfect solvent and transporter which forms the backbone of the Warrior Rx formula by providing the foundation that maximizes the effectiveness of the other ingredients. DMSO is widely known to multiply chemical reactions – that’s why you only need a few drops of Warrior RX to experience incredible results. Emu Oil This herb has been used to loosen congestion that may occur due to a cough or cold, and to treat and prevent and soothe gastrointestinal irritations and inflammations along with ulcerations of the stomach. Emu Oil eliminates inflammation caused by arthritis joint swelling and bone abrasion due to lack of cartilage in just 14 days. Menthol An effective pain reliever, menthol has been shown in double-blind, placebo-controlled studies published in the Journal of Clinical Rheumatology and the Journal of Aging and Physical Activity to be among the world’s most effective pain-relievers for osteoarthritis. MSM Delivers pain relief and promotes healthy circulation, which in turn helps your strains and sprains heal faster. St. John’s Wort Oil Used by battlefield physicians in ancient Rome, this substance hastens the healing process. 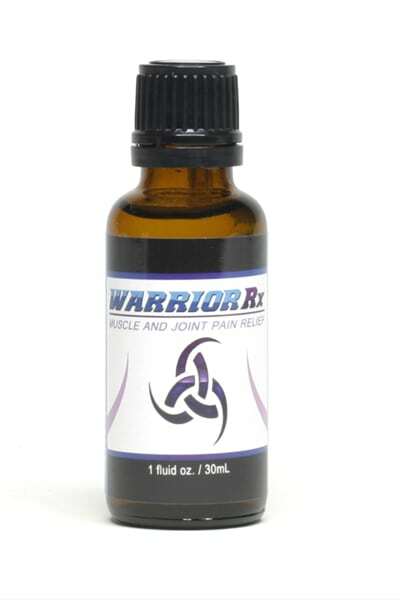 Along with the above ingredients, WarriorRx Muscle and Joint Pain Rub also contains the uniquely beneficial ingredients Calendula Oil, Ginger, Limonene Oil, Olive Oil and Wintergreen all in a special proprietary blend that works together to fight all kinds of pain on contact. USES: Soothing relief to joint and muscle aches, pains and sprains. SUGGESTED USE: Adults and children 2 years of age and older: Apply 2-5 drops to affected area not more than 3 to 4 times daily. Wash hands before and after use. Children under 2 years of age: Consult a physician. WARNING: For external use only. May produce temporary skin irritation, please discontinue use if this occurs. Do not use on wounds or damaged skin. Do not apply heat after using this product. When using this product: Avoid contact with eyes and do not bandage tightly. Stop use and ask a doctor if discomfort worsens, or if it persists more than 7 days, or clears up and reoccurs again within a few days.